A true love story never ends..especially with food. How are you spending with your love on on this special day? 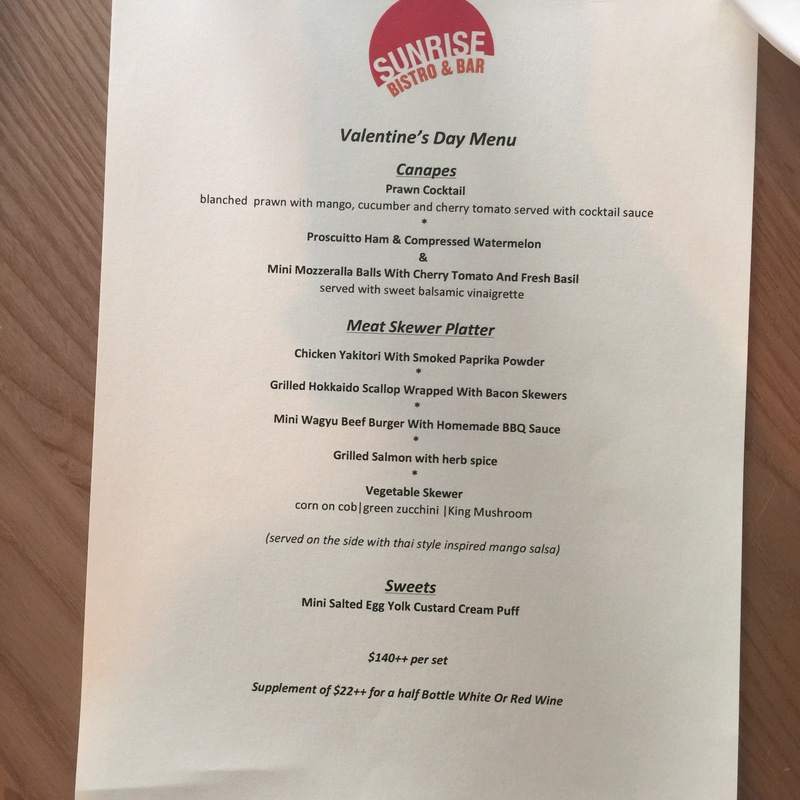 If you have no plans , why not start to plan one at Sunrise Bistro? 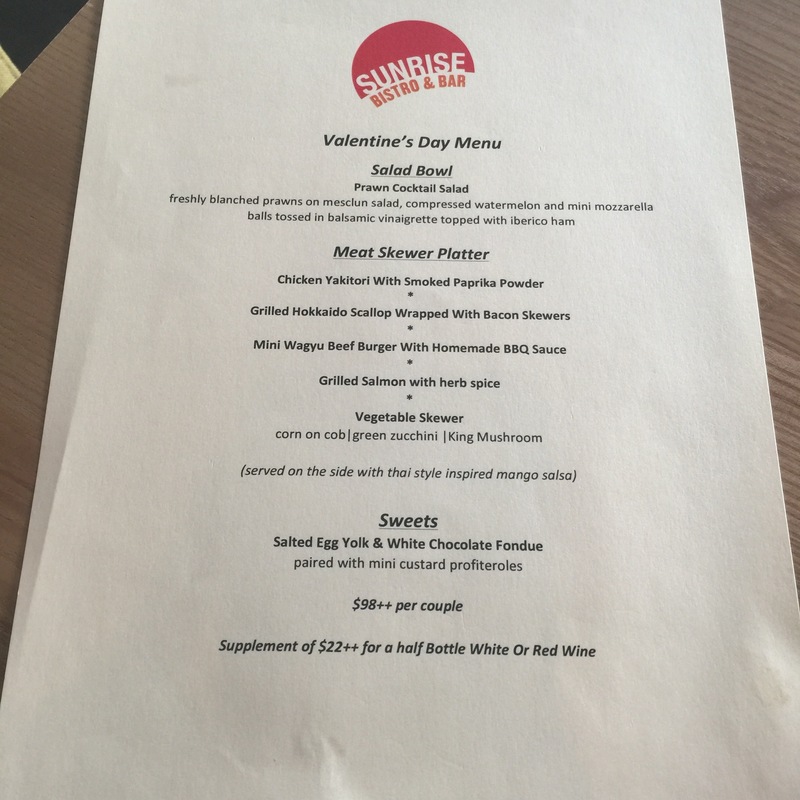 Sunrise Bistro, a place which gives you a fine dining experience at an affordable price. I have been to this place twice and the quality of food never disappoint me. This year, they have come out with a pretty cool concept for valentine day, and they are looking into having this kind of concept in any other special occasions. When i first looked into the menu, my first reaction was ” thats not so affordable” ,but after I get to know what this concept is about, I just feel that its all worth it. Whatever you see above is what you are getting. Yes, including the lovely basket. Its so pretty ain’t it? 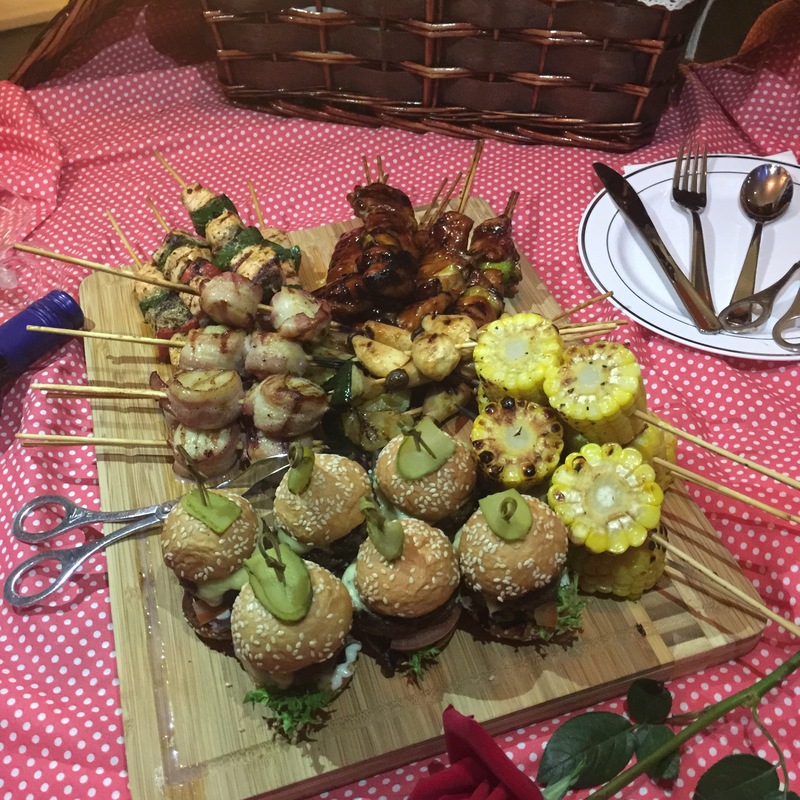 Executive Chef Vincent Teng wants to think out of the box compared to any mundane dinner at any restaurant, hence he came out with this- Picnic in the basket. Click here to make phone reservation. Convenient and easy are the keys of this concept and the attentive chef has definitely nailed it. Need not worry that you would make a mess while having a romantic meal with your love one by the beach/Gardens. Blended fresh prawn with mango,cucumber and cherry tomato served with cocktail sauce and it totally stimulate your taste buds. Mozzeralla balls that gives you a little lactic taste and it balances off quite well with the tomato and fresh basil. If you are 100% asian, you may not get used to this dish. I took a bite of the ham and I feel that the taste is too heavy for me, but when I ate it with the compressed watermelon, the combination just made me want to have more. All the meats were tender , juicy and really nothing we can be picky on. The one and only thing I may pick on is probably the buns used on the mini burgers. Don’t get me wrong, it was tasty but would be perfect if the buns are softer for a better bite. This is served on the side with thai style inspired mango salsa. Corn was fresh and sweet and mushroom was so tasty. Its so easy now right? Put the whole piece of cream puff into your mouth and enjoy awesomeness of the salted egg custard! Of course, you can’t compare to the salted Egg Fondue as the salted egg custard is limited in each puff, but hey it’s so much more convenient to have this if you are eating outdoor. Opting to celebrate Valetine day indoor instead of outdoor? No worries, Chef Vincent got it covered. They have an indoor menu as well. Dishes in the menu are pretty much the same , only excluding the mozzarella balls ,Proscuitto Ham with watermelon , and the dessert is of a different style. 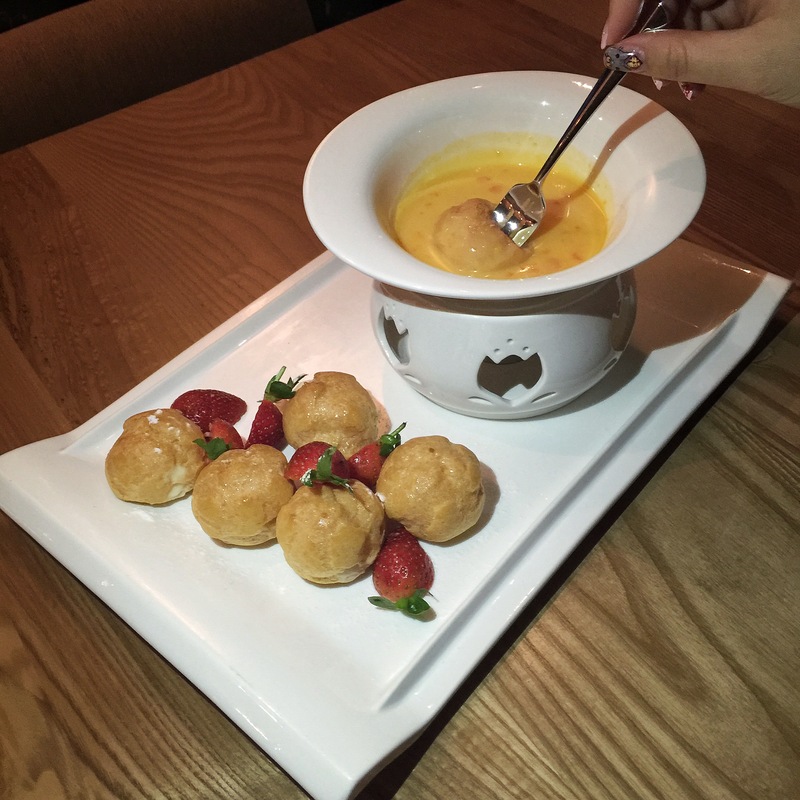 Everyone has tried chocolate fondue, how about salted egg fondue for a change? 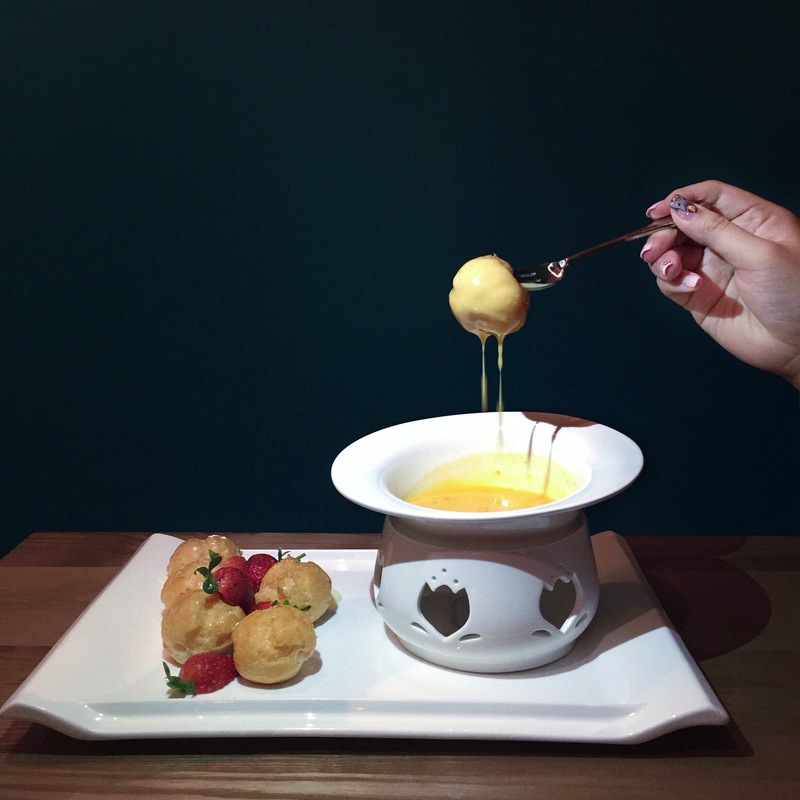 Paired with mini custard profiteroles, this dish has won my heart.